All spring, Fernando Tatis Jr. has been looking for a spark to elevate a batting average that lingered around both sides of .200. But what he's lacked in consistency, he's made up for with power. 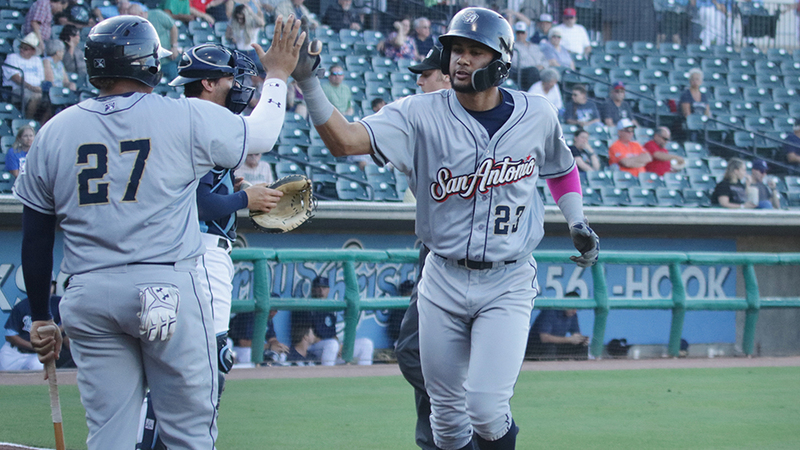 The top Padres prospect slugged a pair of solo shots for his second multi-homer game of the season, but Double-A San Antonio dropped a 5-4 decision to Corpus Christi on Tuesday at Whataburger Field. Tatis has eight homers -- all solo blasts -- and raised his batting average to a season-high .235. Tatis entered May with a .177/.231/.333 slash line. Kickstarted by a 3-for-5 night with eight total bases on May 1, things seemed to switch with the flip of the calendar. Over the last 14 games, he's batting .333 with five homers and an OPS topping 1.100. The change, Tatis said, has come from learning the lesson all Minor Leaguers must learn. "Last month, I was just trying to do way too much at the plate," he said. "Everything was getting into my head, like 'I've got to do this and I've got to do that.' I talked to my coaches and I realized that anytime I do good in baseball, it's when I just let it go. I just need to let things happen, and it's only a matter of time until things get better." MLB.com's No. 7 overall prospect took the plate to lead off Tuesday's road contest and immediately let it fly. On a full-count fastball high in the zone, Tatis teed off on starter Alex Winkelman and knocked it over the left field wall. After grounding back to the mound in the third, he faced the left-hander again in the fifth. With the Missions leading, 3-0, he deposited a 2-0 offering over the fence in center. Tuesday's homers came three weeks after the 19-year-old from the Dominican Republic went yard twice in a 5-2 loss to Frisco. "I'm just approaching things better now," he said. "For me, when I get to a new level and start learning and learning, I can take the plate and feel like I'm getting better each time up there. "I've just got to lay off the bad breaking balls and low fastball and keep trying to get better every day. At this point, I'm not trying to think too much. All I want to worry about is getting to the big leagues as soon as I can." Corpus Christi erased the 4-0 deficit in the seventh as Lorenzo Quintana delivered an RBI double and Alex De Goti followed with a two-run single. De Goti scored the tying run when left fielder -- and Padres No. 14 prospect -- Josh Naylor misplayed Stephen Wrenn's base hit and Carmen Benedetti came through with an RBI single. De Goti, Myles Straw and Josh Rojas had two hits apiece for the Hooks. Padres No. 8 prospect Logan Allen started for the Missions and gave up four runs on eight hits over six-plus innings. He struck out six and walked three.